For outdoor lovers who don’t mind some chill in the air, winter doesn’t mean you have to abandon camping. Tent camping is doable given you have the appropriate gear. The months of December through February are considered a quieter time in Moab, for those of you who may be seeking solitude. The lack of crowds is astonishing compared to the high season, and camping will give you a new outlook on the magical healing powers of the red rock desert. In spite of Moab being a high desert climate with an elevation of 4,026 ft, it has higher humidity than similar environments due to its proximity to the Colorado River. The sheer red rock walls trap and hold moisture, just as in the summer they store heat. Although it might be 40° the real feel could be closer to the low 30’s. The average precipitation during the winter months is less than one inch, and is generally in the form of snow. However it melts as quickly as it comes! For your comfort, having the right gear will make your experience that much more enjoyable. If you don’t have a camper and are tenting-it, make certain you bring your rain fly for protection from the precipitation and wind. Bring a warmer sleeping bag than you would use for the summer and if you have a thicker sleeping pad, it will fend off the cold earth. Lots of layers including merino wool and a puffy jacket to don after your recreating will ensure you stay warm. Fires are allowed in fire pits in organized campgrounds and on BLM lands, but please make sure that you are using an existing fire pit. Sand Flats area camping is open all winter: visit www.sandflats.org for a map and regulations. Arches National Park keeps half of Devil’s Garden campgrounds open through the winter and this would be a great year to check it out, as the campground will be closed March-October 2017 due to a major construction project. There are several commercial campgrounds in town open year round as well. As we like to say at GuestGuide, there is no such thing as bad weather, just the wrong gear! 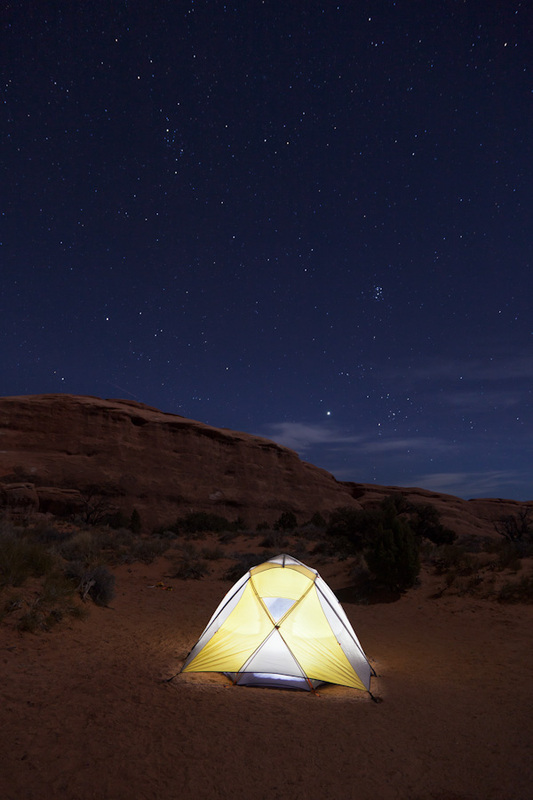 Experience Moab in an entirely new way by camping in the winter!